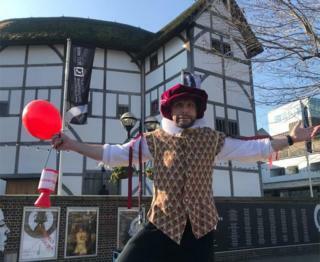 A man is Morris dancing from London to Norwich to raise money for his actor friend who died from sudden adult death syndrome (SADS). The 118 mile journey is being danced by Nicholas Potts to fund raise for the British Heart Foundation in memory of 28-year-old Joshua Mills. He is recreating Elizabethan actor Will Kempe's dance, who completed the feat in nine days in 1599. Mr Potts said: "He'd be laughing at me for this but would have joined in." On Tuesday he danced the first 21 miles from London to Brentwood, Essex. Setting off from Shakespeare's Globe Theatre he "pranced" in a "Morris style" for seven hours dressed in full Elizabethan costume. Mr Potts only took up Morris dancing two weeks ago. "My feet aren't too bad but my thighs feel like they're on fire," he said. His friends and family supporting have been supporting him along the way with pasta and drink stops every 90 minutes. The 37-year-old actor met Mr Mills six years ago whilst touring English language plays around Europe and during one show, Joshua played Richard Burbage against Pott's Will Kempe. "Some 419 years ago, Will Kempe notoriously morris danced from London to Norwich over nine days, after being fired from Shakespeare's Lord Chamberlain's Men. "In Josh's honour, I am repeating this ridiculous feat," Mr Potts said. "Josh was known for his wit and his constant desire to find the next adventure. This has inspired me to take on this challenge and raise enough money to fund research into this dreadful condition." Mr Pott's dancing will take him through Essex, Suffolk and Norfolk and will end in Norwich on Thursday 7 March. A Just Giving fundraising page has been set up to raise £50,000 for research into SADS. Hankies and sticks: Why do people take up Morris dancing?